Do you love Halloween but dread the enormous emphasis on sugar? Get into the spirit of things, without the subsequent sugar low with this selection of healthier Halloween snacks. They’re lots of fun to make, look wonderfully spooky and are yummy for children and adults alike. 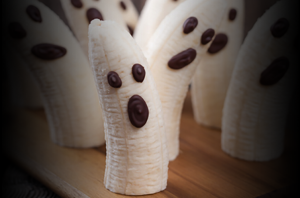 These banana ghosts are a super easy and make a much healthier Halloween Treat. Or, if you have a fan of the ghost stories and the supernatural in your family, these also make a great party snack! 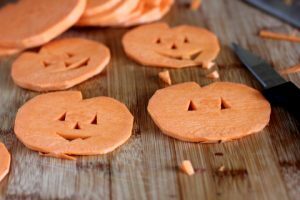 Easy to make, crispy and delicious, these sweet potato fries are perfect for Halloween party-goers of all ages. 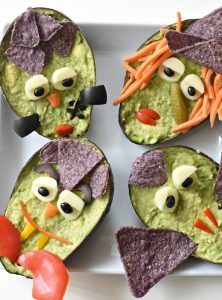 This is for the spooky creatives among us – Guacamonsters are packed full of goodness, no refined sugar and plenty of veggies. This recipe has instructions for the four different monsters pictured, or you could let loose and make ghouls from the darkest depths of your imagination! 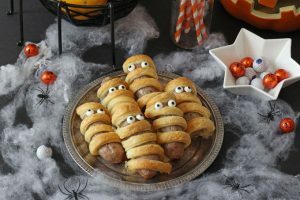 Another savoury party food, these Sausage Mummies simply use sausages and puff pastry, baked in the oven. If you can’t find edible eyes, simply cut little cheese rounds and dab on some Vegemite for the pupil! This one is lots of fun and the end result looks hilarious, gross and delicious all at the same time! 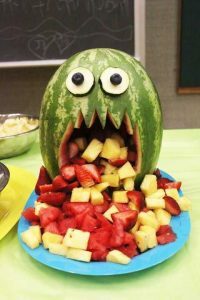 You could try adding some chopped up rockmelon or honeydew melon as well.